It's estimated that 10% of all gift cards just sit in a drawer, gathering dust. That's about a BILLION dollars in gift cards that go unused every year. If you have a stash of unused or unwanted gift cards, you can trade them or sell them for cold, hard cash. A host of Web sites act as gift card exchanges, buying unwanted cards for less than the value stored on them and reselling them at higher prices (though still less than stored value). Some sites offer up to 92% of stored value for certain cards, and resell cards for as little as 65% of their stored value. What you may get for a given card depends on how easily the buyer can resell it. A Walmart gift card has a higher cash value than a card from a local vegan restaurant, or the Rubber Duck Superstore, simply because there are more potential buyers. The discount the buyer figures they will have to give when they sell the card also affects what they can offer for it. • You type the card’s issuer name (e. g., “Target”) and the amount stored on it into an online calculator, and get an offer. • If you like the offer, you may be able to enter the card’s serial number and PIN to submit it electronically. Otherwise, you’ll have to mail the physical card to the buyer. • After verifying the legitimacy of the card and the amount stored on it, the buyer sends payment to you. Each card exchange has its own wrinkles on the basic process. 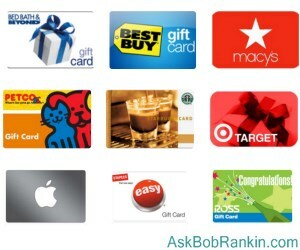 Cardpool.com lets you sell your gift cards electronically in many cases. If you're mailing physical gift cards, they'll give you a free USPS shipping label to send them in. You have the option to get an Amazon eGift Card, or Cardpool will mail you a check within 1 business day of receiving your cards. Cardpool also requires your credit card details in case the gift card is fraudulent, or was used after being submitted electronically. In that case, your credit card will be charged the amount you claimed was on the bogus gift card. GiftCard Zen estimates that there's about $300 per household in unused gift cards. They've helped over 50,000 people with buying or selling their gift cards, and they deal with over 800 merchants. Instead of mailing checks, Giftcard Zen pays via Paypal, within 10-14 business days of receiving your cards. I can vouch for the integrity of the folks at GiftCard Zen, because I know the founder of the company. They also have a funny and informative video on their About Us page, which explains in detail the process of buying and selling gift cards. If you don't want to sell your gift cards online, some Target department stores will accept competitor's gift cards for in-store purchases, oe exchange them for a Target gift card that can be used for online purchases. It's great to trade in your unwanted gift cards for cash. But you can also save money by purchasing a discounted gift card. Let's say you plan to buy something. GiftCard Zen currently offers gift cards from major retailers that can save you up to 7% at Southwest Airlines, 11% at JCPenney, 12.5% at American Eagle, or 16% at Brookstone. There are plenty of others, with discounts of 20% or more. The biggest discount I found on the site was for up to 36% off at Talbot's. The larger discounts typically require the purchase of higher-dollar cards. Each exchange also limits the amount of money in which it will deal. Some exchanges will buy or sell cards with up to $5,000 stored value, while others draw the line at $200. Most exchanges require a minimum of $20 in stored value, but you can combined the smaller values stored on multiple cards in one sale. It pays to shop around for the best rate on the card(s) you want to buy or sell. It also pays to do some due diligence on a card exchange before handing over your cards. MonsterGiftCard and CardCash are some others you can check out before deciding where to sell a gift card for cash, or buy one at a discount. Sams Club has a page where you can purchase certain gift cards at a discount. For example, you can grab two $25 cards for Papa John's Pizza, or five $10 cards for ColdStone Creamery for $39.98. The best exchange rate - 100% - may be available simply by calling the issuing merchant and asking for a refund of the balance on an unwanted card. It doesn’t always work, but it does often enough to be worth a toll-free call to the customer service number on the back of the card. Your thoughts on this topic are welcome. Post your comment or question below.. Most recent comments on "Cash In On Unwanted Gift Cards"
Does anyone have any rational reason for the existence of gift cards? Do they have any advantage to anyone (except the merchant) over cash or a check? I guess people buy them to convey the illusion that they selected a gift. I can think of one advantage. If someone gave me a generic debit card, or Wal-Mart card I would probably use it to pay for "normal, everyday purchases". With the specialty card (one year I got a B&H card) the money might go to a purchase you might actually remember. I knew someone who was a drug addict, who used to pay her drug dealer in these gift cards, so he could hide his illegal income. I think it's one of the main uses of this crap. Most gift cards have an expiry date on them and almost every gift card I have received has re-surfaced after the use by date unless I have made a special effort to go and redeem within a few days of receiving it while it is still fresh in my memory. As I see it gift cards are mainly a gift to the issuing store, not the card recipient, so the information that you have provided in this article could come in very useful. I don't know the exact details, but I believe there is a federal law against credit cards expiring within 5 years from purchase. There is a bit of a loop hole in that the merchant can charge some sort of annual inactivity fee, but I think there is a limit on that as well. Either way, these merchants all have their own expectations on the percentage of GCs that go unused and plan accordingly.